of the legendary Emperor Mahabali. The festival falls in the month of Chingam and lasts for ten days. The festival is acknowledged for its colorful and vibrant celebrations like Onnapotan (a Kerela art form), Puli Kali (Masked leopard dance), intricate flower carpets and the like. Besides these festivities, prayers are being offered in Hindu temples by Hindus and the non-Hindus are not allowed to enter the sacred temples. 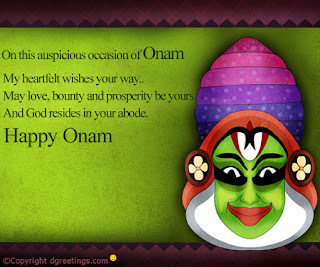 Onam is a venerated feast for Mahabali, a revered figure since the primordial times. Atham, followed by Chithira that makes way for Chodi, in succession comes Vishakam subsequently followed by Anizham, Thriketa, Moolam, Pooradam, Uthradom and finally comes, Thiruvonam, also known as “Second Onam”. Colors, flowers, new clothes, performing various folk-dance and other cultural activities become the hallmark of Onam. It is the picturesque fervor that adds to the dramatic element in Onam. It is amazing to see the legacy of Onam going in the modern times. It’s a ritual that marks the succession of the Keralite traditions and customs. People who cannot make it to the festival send their loved ones greeting cards, online and through mails. 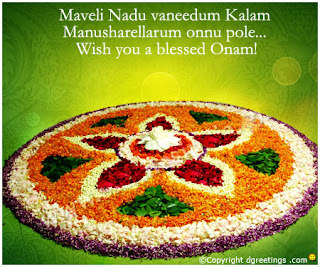 Greeting cards in Onam keeps the spirit of the festival alive in people near or far. The festival of color and flowers has gained immense popularity. Thus, the ongoing revelry and rejoice!